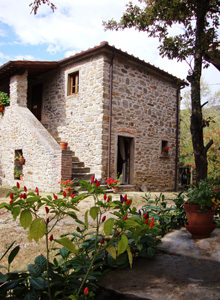 The two 18th century traditional stone farmhouses of Tenuta Savorgnano are set in large grounds amongst peaceful wooded hills in the small hamlet of Savorgnano, between Anghiari & Subbiano. Anghiari is a stunning medieval hilltop town with its impressive battlements and network of stepped and cobbled streets and becomes a favourite for many guests. The main house has three bedrooms with modern ensuite bathrooms plus spacious sitting and dining rooms and a well-equipped kitchen. The apartment has one bedroom plus a living kitchen and its own private patio. All guests have use of the large 12m x 6m swimming pool and there is a car park with ample off-street parking. We recommend the use of a car to get the most out of your stay at Tenuta Savorgnano. Airports. The most convenient airports for reaching us are Pisa, Perugia and Florence. The majority of low-cost flights to the area arrive in Pisa which is about two and a quarter hours away. Both Florence and Perugia airports are about an hour away. In addition it would be possible to fly to Bologna, Forlì, Rimmini or Rome. Trains. Local trains link Subbiano (15 minutes away with free station parking) with the main line trains from Arezzo. From Arezzo there are good train links to Florence, Pisa and Rome. Trains in Italy are reasonably priced and make a good option for visiting towns with more limited parking such as Florence. Find train information at www.trenitalia.com - you can pick the English language option in the top right corner. Buses. A local bus links Savorgnano with Subbiano three times a day except on Sundays. The bus network between other towns is extensive.